I was sure that I’d posted this blog posting back in mid-January, but I just discovered it sitting in my “Drafts” folder, so apparently I did not. At any rate, I’m posting it now! 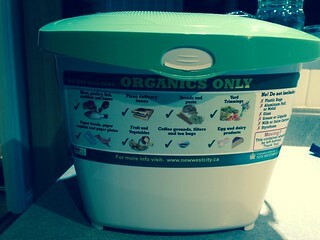 As of January 1st, it has been illegal to send any organic waste to the landfill in Metro Vancouver 1. Apparently, for the first six months, residents and business who break this rule will just be issued warnings, but after that there will be fines. I was a little concerned when January 1st came and went and nothing had been mentioned in my building about getting compost bins for our places, but then a few days later a memo went up in the elevators saying that on Jan 15 our waste management company would be set up in our lobby with information and free compost bins for everybody. I’m unnaturally excited by this. My sister lives in Toronto and they’ve had city-wide compost pick up for years. When I went to the University of Guelph, the city of Guelph was piloting what they called at the time (if I recall correctly), wet/dry garbage pickup, where you had one bin for wet garbage (like food waste) and another for dry garbage. That was back in 1999/2000. So it’s nice to know that Metro Vancouver has caught up only 15 years later. The people giving out the buckets claim that the bucket’s lid has some sort of magical sealing property that prevents odours and fruit flies, but from talking to others who have already had their compost bins for awhile, I’m not holding my breath that this will be true. Also, I was checking out the City of New Westminster’s webpage on food scraps collection (because, did I mention, I’m unnaturally excited by this? ), and this sentence made me laugh: “Each residential unit (apartment or condo) was provided with a kitchen container to collect pre and post consumed food scraps.” I don’t think you really want my “post consumed” food scraps. I mean, I’m assuming what they actually mean is food that’s leftover and you are getting rid of after you’ve consumed the rest of the food, but any “post consumed” food will be taken care of by the sewage system, thank you very much. 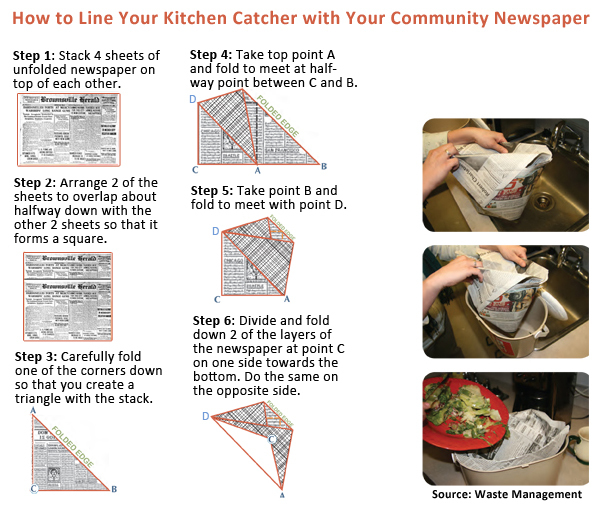 I like how they specify that you should use your “community newspaper” to line your compost bucket. Not sure if this is meant to be a commentary on how the city feels about their community newspapers… At any rate, I am cheap so I think once I’ve used up my free paper bag with corn-based plastic-like lining that came with my bucket, I might just give this whole origami thing a try3.